With Speedy Media's mobile platform, MobileXL, you can maintain a single integrated database that combines the power of SMS Mobile Text, Instant Message, Email, Facebook, MySpace, and Twitter! Digital communication has diversified and so has audience preference, making it nearly impossible to reach your entire target group with just one channel. Baby boomers use email every day. Generation X relies more on instant messaging. Young adults prefer text to email. And now nearly half the world can't function without social media. The only way to reach 100% today is to incorporate all channels of communication. MobileXL integrates five of the most popular messaging channels including mobile text, email, IM, voice broadcast and social media, taking you far beyond just email or mobile text marketing alone. With flexible ways to subscribe, your customers are more likely to sign up. Also, with All-In-One Marketing you can boost profits by increasing response rates up to five times more than if you were to use only one marketing channel. Orchestrating a successful campaign becomes simple with MobileXL's All-In-One Marketing. Say a thousand words about your upcoming sale with vivid pictures in your email. A few days later, send them a mobile coupon. Update Facebook and Twitter to build anticipation. Use a voice broadcast the day before to add a personal touch. Although someone may not opt-in to all five channels, having a customer subscribe to an additional one or two enables you to double and even triple your response rate. Expand your reach and influence by tapping into the instantaneous digital lifestyle of today's customers. MobileXL gives you five powerful marketing channels in one package, saving you the cost and problem of managing five separate applications and databases. Sign-up today for a free 30-day trial. Put yourself ahead of your competition with the same exclusive marketing leverage as Fortune 500 companies at an All-In-One price. Mobile Marketing makes up a key foundation of MobileXL's All-In-One Marketing. No other marketing media has proven to be as effective, speedy, and targeted. MobileXL Mobile SMS marketing can also be engaging, social and fun. Its features include group texting, mobile keyword, mobile voting, mobile coupon, and more. All you need is an ordinary computer with Internet to access our web-based software with nothing to install. Most of all, MobileXL is easy and very affordable. Find out how MobileXL mobile marketing can outperform email marketing, resulting in immediate and measurable impact on your bottom-line. Businesses and organizations utilize MobileXL's web-based software for its Mobile Keyword technology and Bulk Texting Services. They utilize the Mobile Keywords to get people to opt-in to their mobile distribution list, and then using MobileXL they send out Bulk SMS Text Messages once they've accumulated a list of numbers to text. You can click here to see how restaurants (just as an example) are using Mobile Keywords and Bulk SMS Texting. Setup as many Mobile Keywords as you'd like in minutes. When people text your keyword it automatically opts their mobile number into your MobileXL database. Automatic replies are texted back to people that text your Mobile Keyword, and you can customize and change this auto-responder text at any time. Send the auto response message once per mobile number, every time the keyword is texted, or once per time frame (day, hour, week, or month). You can also send an Alternate Auto Response text message if someone has already texted your keyword before. People can text your Mobile Keyword followed by a message they want to send you. All of their messages will be captured in your MobileXL Inbox or you can have them forwarded to an email or mobile phone of your choice. Automated and recurring messages can be sent to any new keyword signups. So if someone texts your Mobile Keyword you can setup an automatic text to be sent to them on day 1, day 5, day 30, day 100, etc. Have a notification texted to your mobile phone or emailed to you when somebody texts your keyword so you can follow up right away. 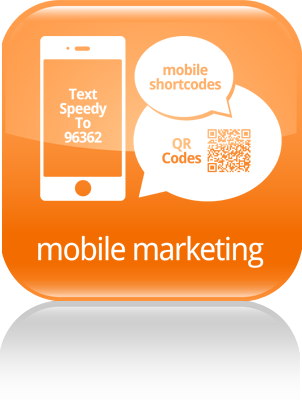 With the SMS Shuffle Responder people can text your keyword and get a different auto responder each time. It's great for setting up a pool of different pre-planned promotional messages to send to your customers. Create and design your own custom Mobile eCards! Upload any image, insert your own text, and send to any mobile phone via MMS. It's incredibly easy, personal, and sure to grab everyone's attention! It's perfect for sales flyers, season's greetings, birthday cards, business cards, and custom banners. Choose from professionally designed templates. Take a cool picture and upload it as your card background. Be creative and choose your own colors and fonts. MMS (Multimedia Messaging Service) is an upgraded way to send text messages that include pictures and videos. It also takes SMS a step further by allowing exchange of text messages beyond the traditional 160 characters in length. MMS is now the new standard in mobile messaging and often times gets 2 to 3 times the response rate in comparison to standard text messaging alone. Using MMS you can increase your brand recognition, sales, promotions, and marketing with tremendous ROI! Instantly communicate a thousand words in a single text message by sending a high-impact picture message. MobileXL's Mobile Picture Messaging uses an embedded WAP link in your mobile text message. A WAP link is a shortened URL that links to any image you upload to MobileXL. You can easily insert the link when you compose your text. Recipients of the text message can click on the link and the uploaded image will be displayed on Internet-enabled mobile phones. The link is automatically shortened so that it does not take up much space in the text message.You can now also eliminate the problems associated with MMS (multi-media messaging). MMS is not universal, and only half the wireless carriers support it for mass texting. It is also costly for both the senders and receivers. Join the new trends in social media and multi-channel marketing by sending picture links directly to peoples' Internet-enabled mobile phones. Maximize your marketing strategy with the speed, convenience, and positive return from Mobile Coupons. You can now electronically offer free gifts, % discounts, incentives, and reminders to your customers with MobileXL's Mobile Coupon Platform. You can also create unique promotion codes for each individual SMS Mobile Coupon and track the redemption and revenue earned from it. Click here to read more. Create all types of fun and engaging SMS votes and polls and ask a multiple choice question with up to ten choices. As people vote via text messaging, every vote is categorized and automatically tallied so that it's really easy for you to see and analyze the results. Click here to read more. Our text messaging platform enables your audience to text your Mobile Keyword followed by a message so it can be projected onto a large screen at your venue in real time. It's the perfect way to keep your audience engaged and entertained! We created a mobile text messaging reminder feature that allows you to easily queue and send automated appointment and reservation reminders via SMS. It's perfect for Doctors, Dentists, Chiropractors, Day Spas, Tanning and Beauty Salons, Automobile Service Centers, and much more. Click here to read more. Two-way text messaging (chatting) allows you to send messages back and forth to individuals. Recipients of a text blast can simply reply back to the text message and their responses will be captured in your MobileXL Inbox or forwarded to an email or mobile phone of your choice. Easily export out all of the replies and messages from the Inbox to an Excel file. Email marketing has proven track record of success for the past 10+ years. However, its effectiveness has started to slide significantly. Although email marketing is an integral part of mass marketing, it should be viewed as only one of many ways to contact your customer base with a successful campaign. With MobileXL, composing a message, building contact database, mailing a campaign and tracking it are as easy as using your favorite email software or webmail, but you can triple its effectiveness when you combine email with MobileXL's multi-channel All-In-One Messaging. Start your Instant Message Marketing campaigns now with MobileXL's easy to use platform. Instant Message Marketing is rapidly becoming accepted in the business community as a viable communications tool and MobileXL is the only service to offer it. You can collect IM screen names using MobileXL's Online Sign Up Pages, or you can import a list of IM screen names so that you can start sending out mass IM blasts to AOL Instant Messenger and Windows Live Messenger (MSN). Connect with your existing fans, friends, and other active users that are on Facebook every single day! Create a Facebook Widget for your fan page so you can collect peoples' contact info and have it automatically update your MobileXL database so you don't have to do a single thing. Update your status messages on Facebook, MySpace, and Twitter right from MobileXL. Filter a list of opt-in phone numbers so that you send messages to mobile phones only. NOTE: MobileXL does not allow sending messages to anyone who has not opted-in to receive messages from your business or organization (under any circumstances). The wireless carriers prohibit anyone from sending unsolicited commercial text messages. Create Online Sign-up Pages so people can enter their contact info on your website and automatically populate your MobileXL database. Choose from dozens of pre-designed Online Sign-up Page templates or design your own Online Sign-up Page to match your website by plugging in the HTML source code. Send an auto-responder (automatic response) to go out immediately after someone signs up on your Online Sign-up Page (maybe information about your company, next sale, or event). Send an Active Auto Responder message via email, IM, text message, or all three. MobileXL's Business SMS Texting Service is perfect for businesses and organizations of any size and type! Economic times like this call for innovation and so it's time to find new and creative ways to reach your customer base. These days online marketing can only get you so far, so your marketing campaigns should be complemented with a strong digital communications strategy that's centered around SMS texting.